If you’ve outgrown your practice hoop and are itching to start embroidering on a big scale, it’s time to get yourself an embroidery machine! With the best embroidery machines, you can execute complex designs and patterns that would be infuriatingly tricky and slow by hand. You can also achieve precise repetitions on trim, logos, and monograms that even the best hand sewists can’t hope to match. Of course, not all embroidery machines are created equal! There are any number of junky models on the market that fall apart in a heartbeat and get tangled up doing the simplest designs. Even many premium models are infuriating to use because they’re so confusingly laid out. Don’t worry! We’ve created this guide to teach you everything you need to know about shopping for an embroidery machine, and to introduce you to our favorite models on the market today. Whether you’re looking for your first machine or trying to replace a beloved workhorse, we’ve got recommendations to help you out! Read on to find out which models we currently recommend and to learn why! This Brother is currently the most popular embroidery machine on the market! It’s easy to see why. It’s affordable, accessible, and versatile. While it might not have the largest embroidery area on the market, it’s an excellent first machine. It’s also an excellent choice for folks on a tight budget who can’t afford to have a dedicated embroidery machine in addition to their standard sewing workstation. It can be used as a standard sewing machine for all your non-embroidery projects! Note: there’s also a very popular Project Runway-branded model offered by Brother. It’s priced to seem like an upgrade over the SE400, but it’s identical apart from the logoing on the case. You can save a considerable amount by going for the Plain Jane SE400. It’s very affordable. 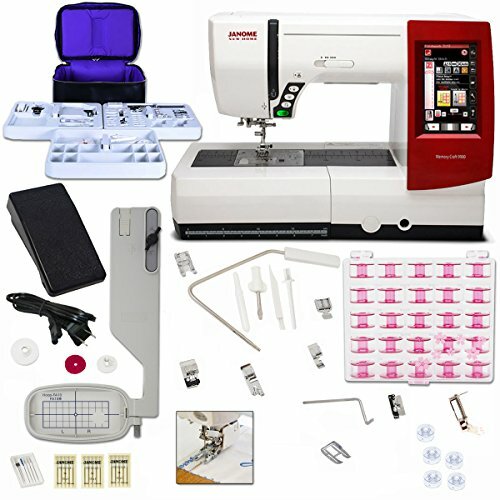 The SE400 doesn’t cost all that much more than a typical computerized sewing machine with no embroidery features at all. It’s a very accessible model for the beginning needleworker and for those more experienced craftspeople who are on a very tight budget. Considering the fact that you get a capable (if compact) embroidery machine in the same package as a solid sewing machine, there’s a lot of value to be had here! You get everything you need in the box, so there aren’t any hidden costs. All embroidery features aside, it’s an excellent computerized sewing machine. Unlike most embroidery machines for this price, you won’t need to have a separate machine for quilting, garment construction and other non-embroidery projects. There are 67 different sewing stitches are built in. That’s in addition to 70 preprogrammed embroidery designs. While most machines around this price only have 30-40 preprogrammed embroidery designs, the SE400 gives you a nice range to work with right out of the box. There are monogramming fonts, icons, flowers, animals–you name it! It’s plenty for the beginner to get started with. Unlike other inexpensive embroidery models, it’s expandable. There’s a card slot for you to expand the memory bank with more designs from Brother or from another design store that uses the standard embroidery format. Thanks to the expansion slot (and USB connectivity), there’s no limit to what you can embroider using the SE400–as long as it fits in a 4×4” square. You can connect to your computer to download additional embroidery designs and firmware updates. This is a convenient alternative to buying pre-filled SD cards. You can buy by the pattern and get designs from pretty much any online source. Just download the file to your computer and then move it over to the machine using the USB cable. The touchscreen display is easy to navigate, even if you’ve never used an embroidery machine before. Most displays on machines at this price are clunky at best, and downright maddening at worst. This one is laid out clearly and you get used to the menus pretty quickly. It features lots of computerized conveniences that make the machine feel a lot more premium than its price would suggest. There’s an automatic thread-cutter built in, as well as push-button controls that allow you to start and stop sewing at an exact speed, using an adjustment slider. Best of all is the automatic threader, which works perfectly. It’s very user-friendly. We’ve already mentioned that the computerized menus are very navigable. This machine also features Brother’s excellent drop-in bobbin design, which we love on machines throughout their range. It’s jam-proof and requires none of the precision and fiddling that traditional, side-loading bobbin trays do. All in all, this is as easy to learn as embroidery machines get. It’s ideal for new needleworkers and any more experienced seamstresses who haven’t worked with an embroidery machine before. While more expensive models certainly have more features and fancy extras, this Brother is very well-equipped. It includes 7 feet in the box, which gives you enough range to handle practically any project. There’s also a bright LED worklight, where most models at this price use dim old incandescents. It’s very well-made for something so inexpensive. The SE1900 and Janome models below are definitely sturdier, but the SE400 is the best-made embroidery machine under $1000. Considering that it costs less than half that much, we think it’s an absolute standout. It’s covered by a 25-year warranty and lifetime phone support. That’s as much coverage as you’ll get on the priciest machines, so there’s no need for buying extended warranties or extra policies. It can only embroider a relatively small area (4×4”). That’s the SE400’s biggest limitation. If you don’t plan on doing anything larger than that, there’s not much reason to spend more for a larger embroidery machine. If you think you’ll outgrow the 4×4” palette eventually, you should consider the Brother model below. There are nicer touchscreens. This one’s easy enough to navigate, but it’s very basic and can’t display colors. The Brother model below has a much nicer screen, as does the top-of-the-line Janome model we’ve recommended as our ultimate pick in this category. Pricier models have more patterns preprogrammed. We don’t think the SE400’s limited preprogrammed options are a huge downside, since it’s so expandable. Having said that, embroidery patterns aren’t always free, and it’s easiest to have options out of the box rather than to have to go and download them yourself. That’s true of this one’s computerized stitching options as well. The SE1900 below includes a lot more variety with stitches as well as embroidery patterns and designs. The SE400 has plenty of options for the average person, but ambitious and advanced needleworkers will want to go for the SE1900. This Brother doesn’t include a hard case. Then again, the more expensive SE1900 doesn’t even have a soft cover, so at least there’s something with this one! The Brother SE1900 is our recommendation to more experienced and advanced needleworkers who want a larger palette to work with and more options under the hood. It gives you the option to work with embroidery on a broader scale than the SE400. It also includes a heck of a lot more options for both stitches and preprogrammed embroidery patterns. It’s definitely overkill for beginners and casual needleworkers, but if you take on lots of projects and are ambitious about your craft, we think it’s a worthy investment. We think this is as much machine as most folks will ever need. The biggest difference between this one and the SE400 is the larger 5×7” embroidery area the SE1900 offers. You can still embroider smaller designs on this machine, but the maximum size is much larger than the 4×4” square that you get on the SE400. That gives you a lot more flexibility to try larger, more elaborate designs and to work on larger, more elaborate pieces! We think that while beginners and casual needleworkers can easily make do with the 4×4” limit on the SE400, the SE1900 is a much better choice for the average user. Even if you’re still learning, it gives you a lot more room to grow than the cheaper Brother. For intermediate and advanced needleworkers, having a wider palette to play with is a no-brainer. Of course, there are cheaper machines with wide embroidery capabilities. What sets the Brother apart and justifies its high cost is its staggering versatility. It has a whopping 240 sewing stitches built in. There are 10 frame shapes, 11 fonts, and much more. That’s not even getting into embroidery patterns! Simply as a sewing machine, the Brother is as good a workhorse as you could want. You have plenty of embroidery options right out of the box, too. There are 138 designs preprogrammed. That’s as much as many people will ever need. It also saves you having to buy as many as you start to get more ambitious and expand your repertoire. There are so many onboard options that you’ll only need to pay for a few custom designs here and there. Unlike a lot of other nicer embroidery machines with this many options, the Brother isn’t overwhelming to work with. Everything is still laid out clearly, and there’s a larger color touchscreen display for navigating all the options. While the screen on the SE400 isn’t bad by any stretch, this one is both more enjoyable to use and more helpful for working with sophisticated embroidery designs. You can see your patterns in full color and the larger real estate makes everything that much more legible. It has a bright LED worklight that doesn’t leave us wanting for visibility at all. You can see everything clearly, and the bulb ought to last for years and years. Like any premium computerized sewing machine, the SE1900 packs an automatic threader, a built-in thread-cutter and push-button sewing controls with a speed slider. It also includes the same set of feet, adding an extra one for zig-zag stitches. There’s an overall qualitative difference coming from the SE400 to the SE1900. Stitch quality is excellent on the cheaper Brother, but it’s even more remarkable how neat and tidy the SE1900 is. Even on very tricky embroidery patterns, it’s stitch-perfect and doesn’t even hint at nesting. One of the best things about it is how little time you’ll need to learn the machine. The SE1900 is very intuitive to learn, even if there’s a lot here for a beginner to navigate. We recommend it to intermediate and advanced users, but it’s very navigable compared to others at its price point. The accessible, intuitive design makes transitioning from another machine (such as the SE400 or one of the cheaper Singer options) extremely easy. As you’d expect from a machine costing around a grand, the SE1900 is a workhorse. It’s built solidly and feels rugged. It’s still a computerized embroidery machine, so there are plenty of sophisticated and delicate internals. Having said that, it has no obvious design flaws and it has a superb track record for reliability. This Brother is covered by a 25-year warranty, just like our other recommendations. It’s getting into a pricier category, even if it’s still relatively affordable for an embroidery machine. On the other hand, since it’s a stellar workhorse sewing machine for non-embroidery projects, the Brother offers a lot of value for its price. Price is the main reason why we don’t suggest this to beginners. It’s simply overkill for what the average beginner actually needs, and it’s more than twice the price of the SE400. That machine is plenty for starting out on, and a good chunk of needleworkers will never outgrow it or feel limited by it. Unless you’re absolutely sure you’ll be sticking with sewing and embroidery, this is far more machine than the typical novice needs. We think it’s the nicest embroidery machine most people need to buy. Having said that, there are certainly even nicer options available. For the most passionate, dedicated home or professional needleworkers, we suggest the Janome model below. Just be aware that it costs more than twice as much as this Brother. The Janome Horizon Memory Craft 9900 is our recommendation to the most advanced, ambitious embroiderers. It’s way more than the average person needs, but we think it’s a stellar investment for folks who want absolutely no limitations to what they can achieve with a needle and thread. Get this if you work on sewing and embroidery every day and want the ultimate workhorse for absolutely every project. The Horizon Memory Craft is an absolutely stellar embroidery and sewing machine that can serve the most demanding needleworkers. There’s nothing this thing can’t do, whether it’s constructing a garment or adding a large piece of embroidery to your new curtains. It’s versatile, powerful, and extremely reliable. Just be sure you’ll get your money’s worth out of it! It’s in a whole other category compared to our cheaper recommendations. Both in terms of speed and versatility, it blows the Brother models out of the water. It’s also sturdier, as you’d expect from any Janome. We should stress that this is far more machine than most embroiderers and craftspeople will ever need. However, if you’re ambitious and want a machine that can take you to the limits of your abilities and then some, we think the Horizon Memory Craft is ideal. You can edit, resize, duplicate, change color, and make countless other adjustments to embroidery patterns right on the machine. It’s a very convenient way to work on the fly. You don’t need to take the design back to your computer and then back to the machine just to resolve an issue or make an alteration in the middle of a project. If you decide you want to tweak something, you can do it there and then with no trouble. The touchscreen is massive and versatile. It displays color accurately, with 65,000 possible tones. You can see everything laid out clearly, even when you’re working on large-scale embroidery designs. It’s a pleasure to use. How often can you say that about sewing machine touchscreens? The processor is super speedy, too. It’s much faster than others we’ve used at or above this price. That makes it very practical to make all your adjustments right on the machine, without any lag to speak of. You can embroider as large as you like on this one! The Janome’s 6.7×7.9” embroidery space gives you lots of real estate for elaborate, stunning patterns. We can’t imagine why you’d need more space than this for any project. It’s roomy enough for the most ambitious users. It also takes smaller hoops as well, which is nice for when you want to work on a small scale without wasting fabric on a large frame. We like the Janome because it pairs the power and range to work on big projects with the precision to do extremely complex and intricate designs. You can execute patterns and designs with 200,000 stitches on the Horizon Memory Craft! There are any number of ways in which the versatility of the Janome shines. There are all the size options we’ve already mentioned. It’s also loaded with 200 stitches onboard and the embroidery computer accepts USB drives as large as 8GB. It’s a powerful workhorse for all your sewing and embroidery projects. Aside from serging, you can do absolutely everything on the Janome. With top speeds up to 800 stitches per minute, it gets the job done very quickly as well. The embroidery unit is detachable if you want to take it off for construction projects, but we’ve found that it’s not in the way when you leave it. Stitch quality is impeccable. Of course, you’d expect that for the price! Still, the fact remains that the Janome does an extremely neat and tidy job on all materials and all sorts of designs. We especially appreciate how powerful this thing is. It has the delicacy to execute decorative touches perfectly, but it can also blast through construction projects using layers, even on tough materials like denim and flannel. One of the standout features on the Horizon Memory Craft is the 9mm maximum stitch width. It’s something that doesn’t get top-billing on marketing materials for this model, but we’ve found that it makes a huge difference in actual usage. You can create much more distinctive edging and other decorative touches with just a little extra real estate. A lot of these ultra-premium models are befuddling, to say the least. Not so with the Janome! It’s not hard to learn, although there are certainly a ton of features.There’s an included instructional video that covers everything you need to know to get up and running. Everything’s thought through nicely and laid out where you’d expect to find it. You can see exactly what you’re doing when you work on this one. It has a whopping 5 LED worklights for maximum visibility, even on large workpieces. You don’t buy an embroidery machine for the lighting, but it makes a big difference in terms of how pleasant this one is to use. Build quality doesn’t get better than this. Everything is rock-solid and nothing feels chintzy. As you’d expect from a Janome, the Horizon Memory Craft has a superb reputation for reliability, too. It’s covered by a 25-year warranty like our other recommendations. The only real downside to the Janome is its astronomical price tag. Now, we should clarify that this is far from the priciest sewing machine on the market. There are certainly costlier options, though we don’t think there’s any practical advantage to spending more than this. There’s no way you’d ever run out of options on the 9900. However, the fact remains that relatively few people will be able to afford one of these, let alone justify the cost. Only buy this if you sew every day and know you’ll get your money’s worth from it. This is a very advanced machine, but it’s not the glitziest in terms of tech. Some more recent models have bluetooth compatibility, which lets you customize designs and transfer patterns from an ipad. However, given how much more expensive they are, and given that relatively few needleworkers actually work with embroidery designs on ipads, we don’t think those models are worth the extra cost. Which of these embroidery machines should you buy? The Brother SE400 is an ideal first embroidery machine to buy. The value factor is superb with this model, since you can use it for all your other sewing projects as well as for embroidery. It might not have as many preprogrammed options as our other picks, but the expansion port and USB cable mean you can easily add as many patterns as you like. Just be aware that it’s limited to a 4×4” square. It’s also more limited as a computerized sewing machine than our pricier recommendations. The Brother SE1900 is a good upgrade option for those more experienced needleworkers who will appreciate some extra versatility and a larger palette to work on. It’s also a good choice for ambitious beginners who aren’t on a tight budget. It offers significantly more room to embroider and a lot more options out of the box. It’s also a more versatile computerized sewing machine for all your other projects. We recommend the SE1900 to most buyers. It’s as much machine as the vast majority of buyers will ever need. The Janome Horizon is our ultimate pick for the passionate, dedicated needleworker. Unless you sew every day and are a particularly advanced craftsperson, it’s overkill. If you can get your money’s worth out of it, though, it’s an unbelievably good machine. It’s versatile, powerful, user-friendly, and very reliable. It’ll take you as far as your abilities can go without ever feeling limiting. You can also count on it to last through years of daily use. However, for the vast majority of buyers, this is way more than enough embroidery machine. Stick with the SE1900 if you’re not certain you’ll get your money’s worth from the Janome. We hope you’ve enjoyed our guide to the best embroidery machines and learned everything you need to know to choose your new workstation! If you want to learn more about any of the models we’ve recommended here, simply click on the links in our reviews to find full specs, features, and so on. That’s also the easiest way to check current prices and see your options for buying accessory packs along with your new unit. Visit our homepage to find more expert reviews, recommendations, and advice covering all your sewing and embroidering needs!